The history of the British Shorthair occupies a substantial part of the history of Great Britain, in fact from about 200 AD to the present. The American Shorthair originates from the British Shorthair and has the same distinction in relation to the United States. With the Persian and Siamese, the British Shorthair is a founding member of the cat fancy. This is a distinguished cat, whose reputation is enhanced by the fact that the appearance has barely changed over almost two thousand years. This cat breed has not be subject of any passing cat fancy fashions (almost). But it has been a bumpy ride. It is thought that the history of the British Shorthair starts with the importation of cats from Egypt by Romans who invaded and settled in Great Britain. At that time the domestic cat’s role was as a mouser. Between about AD 200 and the beginning of the cat fancy in the late 1800s the British Shorthair was a semi-feral cat or domestic cat evolving naturally within a large gene pool. New settlers to Britain might have brought their cats, which widened the gene pool. Before the late 1800s there was neither a cat fancy nor the concept of purebred cats and cat shows. There were just domestic cats as companions to people. Today for the vast majority of people that is still the case. About 98% of cats are not purebred cats. The British Shorthair has made the transition from a domestic shorthair cat living in Britain to the British Shorthair cat seamlessly to outsiders but as mentioned the road was not untroubled. It could be argued that the cat fancy started with the first cat show at The Crystal Palace in London on 13th July 1871 (see a short post on the opening of the Crystal Palace). This was an all breed cat show in a very grand setting. The Crystal Palace had opened some 20 years before as a major exhibition center. It was made of glass and steel. The show was organized by Harrison Weir an animal fancier and natural history artist who in fact judged poultry. He kept a blue tabby British Shorthair cat called “The Old Lady”. The old Lady, aged 14, won best of color class at the Crystal Palace show. The show was very popular. Mr Weir was a judge at the show and is considered the founder of the cat fancy. As a point of interest, Mr Weir built a large house in Kent, England, called “Weirleigh” in 1866. It still stands and was occupied by the famous war poet Siegfried Sassoon. It was valued at £800k at 2004. At the turn of the century (1900) Mr Weir felt that cats imported from the East (Persians) were damaging the British Shorthair cat. This is a reference I believe to the crossing of the natural and at that time “pure” Brit SH with Persians to make them more cobby (and therefore more attractive or outstanding). Perhaps this is one of the first examples of a “refinement” of a breed through selective breeding. The problem was that the good old ubiquitous British Shorthair was too much of an average looking cat. If people had a cat it was in effect a British Shorthair or an English cat. Although of course not a purebred or pedigree cat. But the show cat looked like the non-show cat and that was an unsatisfactory state of affairs for cat breeders. The Persians and the Siamese were in favor because they were rare and I suppose more exotic having come from the far East. In the early 1900s Siam (now Thailand) was a long way away as there was no aviation industry. The concept of flight had only just been invented on 17th December 1903 by the Wright brothers. Travel would have been a slow journey by train and ship. Few people would have traveled abroad. Interestingly, around 1900 the ideal coat pattern would have been a spotted one. This resembles the feral cats of Egypt, the feral Eygptian Maus. I wonder if there is a connection here with cats the Romans brought over from Egypt. Where the English cats in the middle ages spotted and more slender? In around 1900, Mr Weir apparently wasn’t appreciative of the longhaired cats becoming more popular than the British Shorthair. After all he had a personal preference for them. Apparently he also felt that the leg length was being bred too short. This would seem to be a result of the first breed standard, which was introduced to promote the breed against the popularity of the Persian. The breed standard included a reference to a conformation that was similar to the sturdy looking Persian. This perhaps resulted in cat breeders crossing the British Shorthair with Persians. The objective was a cat with a plush dense coat and a sturdy appearance. Crossing with the Persian also took place after the world wars (see below). This policy was of debatable benefit to the cat breed in the long term. The breed standard also required the Brits of the time to have self (solid) blue (diluted black), black and white. Tabbies had to be black, red and silver. Then there were the tortoiseshells, tabby and white and tortie and white. The Brit had a framework upon which to compete. British Shorthairs were exported to Scandinavia and continental Europe. The breeding in these countries took a slightly different course with no outcrossing with the Persian. This difference was recognized in a different name in the early 1980s, the European Shorthair. The first Brit SH was exported to the United States early on in the cat fancy, in about 1910. The development of the breed in the United States appears to have been similar to that in the UK. At least the cats look very similar. The European Shorthair is less cobby and more like the original English domestic cat that the Brit SH once was. (see an article comparing the three breeds, the American, British and European SHs). The popularity of this cat gained ground, backed up no doubt, by the desire of the British cat fancy to see their native cat do well. This takes us to the two world wars. I guess war is not a time to be involved in the cat fancy and the history of the British Shorthair cat took a turn for the worse and cat quality declined. Outcrossing to Persians took place after WWI and the GCCF declared that only third generation offspring of BSH/Persian matings could be shown. This was a set back as was WWII, which reduced the numbers of cat association registered cats to a very low level. After WWII cat breeders outcrossed to domestic cats, Persians, Russian Blue, Chartreux and Burmese and others. This breeding (was it a policy or just ad hoc breeding that was unregulated?) caused more problems but helped to save the BSH and cat breeds such as the Chartreux, also badly effected by WWII. The influences of the outcrosses in changing the appearance of the British Shorthair had to be dealt with to bring this cat back to the way she previously looked. Cat breeders successfully brought the British Shorthair cat back to the original appearance albeit looking more cobby. It is a little sad that the original genetic make up could not have been retained during the 20th century. 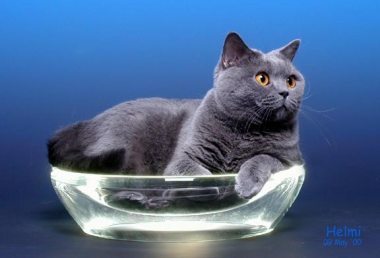 The history of the British Shorthair complete, the only topic left is the future. Cat breeders may wish to try and improve the breed. This should be resisted except to further ensure that this cat remains as she should always remain, a nicely balanced cat of average dimensions to match the way she was those centuries ago. This entry was posted in British Shorthair, Cat Breeds and tagged British shorthair cat, The history of the British Shorthair by Michael Broad. Bookmark the permalink. I love British Shorthairs. I have one and haven’t looked back. Hi Vaala. Lovely to hear from you in Iran. I have been to Iran. I was there in 1971. Things have changed. I try and put as many pictures as I can of cats on the site. I’ll add some more. If you can tell me in a comment what is it like in Iran for the domestic cat, I would love to hear from you. How many people have domestic cats in Iran for example?